Officials from the Ministry of Agriculture broke ground on Monday, February 13, 2017 on a new project which will enable farmers to access their lands more efficiently. Head of Physical Planning Jerome Meade explained that heavy rains causes continuous erosion of the access road to the farm lands in Upper Blakes, hence the reason for the project. This project is funded by the Global Climate Change Alliance (GCCA) Project on Climate Change Adaptation (CCA) and Sustainable Land Management (SLM) in the Eastern Caribbean. The Euro 140,945.88 contract was awarded to the Galloway Group and should last for four months from 6th February 2017. Engineer Adrian Galloway, said the Galloway Group was fortunate and honoured to be a part of the project which will help improve Montserrat’s physical infrastructure. The contractor is tasked with laying 700 metres of concrete and drains to enable surface water run off. Hon. Minister of Agriculture Claude Hogan, said this contract was part of a much bigger programme to improve Montserrat’s capacity to produce enough food to feed ourselves. A National Steering Committee for Climate Change was formed in March 2014 with the aim of managing a five-year programme to build local resilience and to ensure Montserrat benefited from the European Union -funded project managed by the Organisation of Eastern Caribbean States. All three projects submitted by the government were approved. 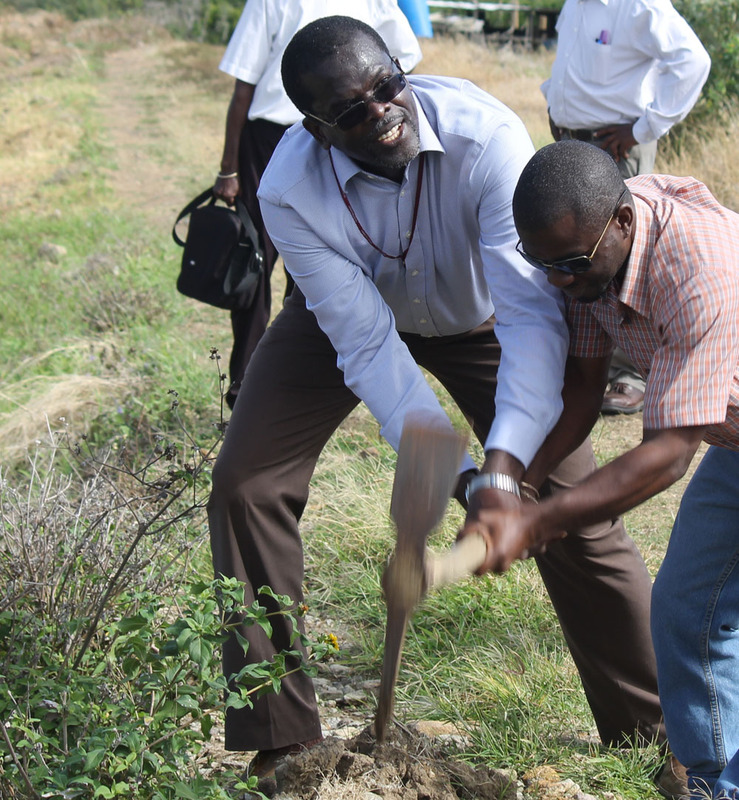 Meade explained that soil stabilization works for Collins Ghaut will be a six-months EC$860,000 project. The final one will be rainwater harvesting and solar power heating at the Montserrat National Trust. Hogan said residents can expect to see tanks and irrigation system across the food belt from Blakes to Salem once the various projects have been approved and implemented. There is a lot happening in farming and agriculture, he added.